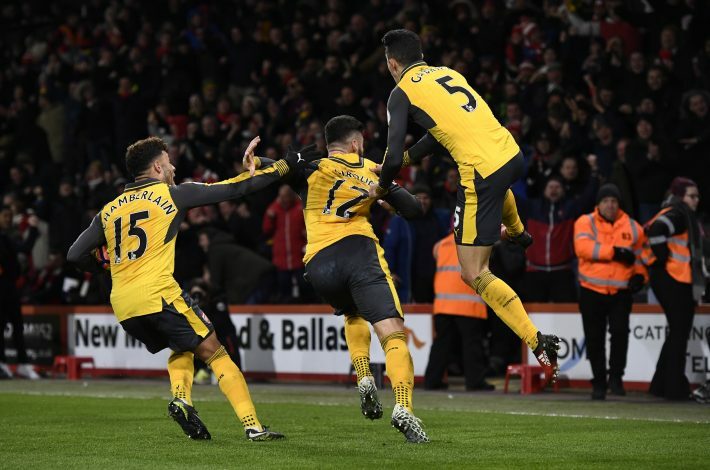 Tuesday night’s dramatic 3-3 draw at Bournemouth came out as a perfect encapsulation of Arsenal’s last 10 years, in many ways. The match dragged down Arsenal right to the verge of catastrophe, with salvation secured in thrilling style, and then everyone starting to wonder whether it was enough or not. The draw also highlighted the increasing divisions at the Emirates, as Arsenal players argued with one another, and Alexis Sanchez reacted furiously at the final whistle. With 18 months left on his contract at the Emirates, and a queue of interested clubs in the market for a world-class talent if Sanchez finally decides to leave, there are increasing concerns over Arsenal’s star man. So could the Gunners really lose Sanchez? As a matter of fact, there are certain factors which can trigger the Chilean’s departure. It was a clear contrast which can show you everything you want to know about this Arsenal squad. One goalscorer couldn’t stop his theatrical leaping into the air just to celebrate an equaliser during the Bournemouth game. The other expressing his frustration – nothing but slamming his gloves into the turf – at yet another missed chance in a title race still there up for grab. Just for a second, put aside the money or the trophies, it’s the shameful difference in attitude between Alexis Sanchez and his teammates which could force him to leave Arsenal. Sanchez is no doubt a wonderful footballer, a genuinely gifted footballer, one who deserves far better than a perennial fight for a mere fourth place. And it’s now beginning to show. Body language like that of the last game has surprisingly become more common this year for a player usually so positive in everything he wants to do. Yes, Sanchez deserves a tilt at the title, a chance to be the deciding factor in the biggest games and the final destination of the Premier League. But as he increasingly ponders what’s next for his future, it somehow hints more and more that he is being pulled back by a team still can’t come out from a perpetual cycle of mediocrity. That is why Olivier Giroud started running towards the corner flag in dramatic ecstasy and leapt, scorpion heels aloft, into a clearly choreographed celebration of the equaliser against Bournemouth. It’s the attitude that okay is good enough for us, that fourth is pretty much good enough, that a draw at Bournemouth, no matter how thrilling, is good enough. That is what will see him walk away if he does indeed decide to. Any guesses on what’s the little boy inside Alexis Sanchez thinking about? His musings are certainly not likely to be anything too complimentary given the Chilean is, quite predictably, struggling to conceal his anger at his team’s recent performances. Like Sanchez at this moment, Robin van Persie almost single-handedly ensured that a talented but erratic Arsenal side hold on to the status quo and grab a top-four spot in the Premier League. 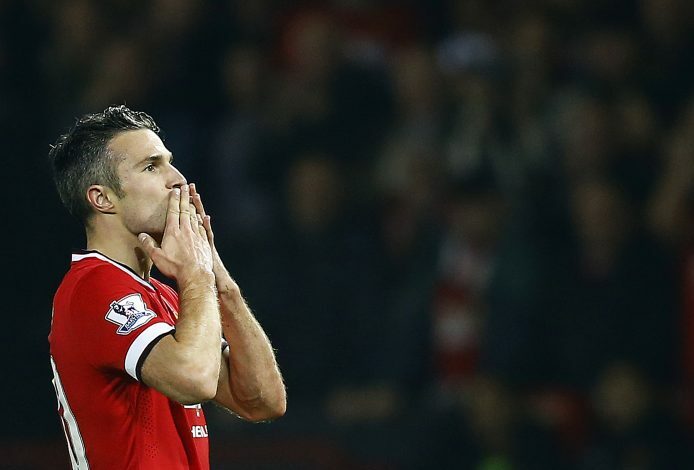 But at the end of the day, van Persie was always going to demand more. We are not only talking about money. His desertion to Manchester United and shocking parting shot at Arsene Wenger will always be painful for the Gooners, but think deeper – in the cold light of day, his departure was completely justified. You have to remember one’s motivation! For the Dutchman, the writing was on the wall as early as February 2012 when he was visibly frustrated by Arsene Wenger’s clueless decision to bring in Park Chu-Young in place of Alex Oxlade-Chamberlain, with Arsenal battling for a point against Manchester United. Sanchez anger at Aaron Ramsey’s recent wastefulness and frustration at two points wasted at Bournemouth are eerily similar to Van Persie’s outburst, and it would obviously take a significant shift in Arsenal’s momentum and mentality to obstruct this situation creating an obvious conclusion. The sight of Olivier Giroud prancing about in front of the travelling Arsenal fans, rolling out a pre-rehearsed celebration, when his side still had time to grab the most unlikely of winners would’ve killed a competitor as ferocious as Sanchez. 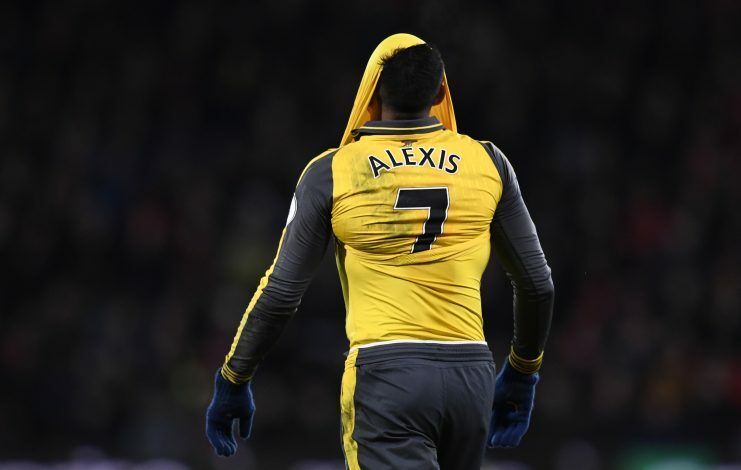 Wenger has taken four years to orchestrate a spearhead worthy of replacing van Persie in Arsenal’s frontline, and the Frenchman, or whoever will be in charge next summer, can’t afford to lose Alexis Sanchez for that very reason. 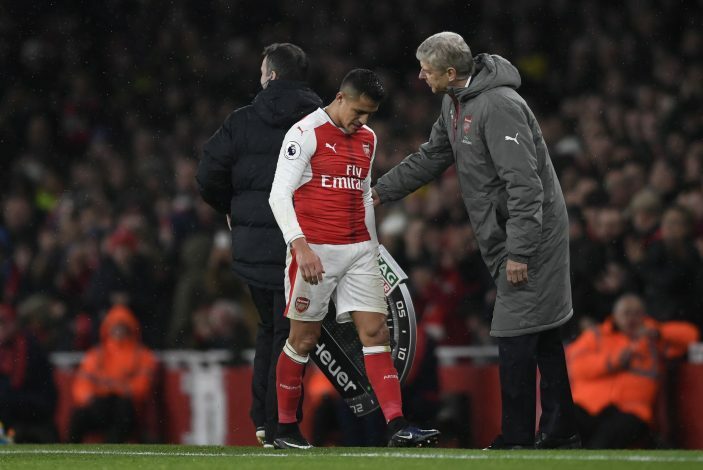 Alexis Sanchez continued his Bournemouth hissy-fit into the Arsenal dressing room which left his teammates fearing the worst – the Chilean will leave. He threw a tantrum on the pitch after the draw, throwing his gloves to the floor and visibly showing his frustration over the joyful teammates suffering a major blow to their title hopes. The Chile international, right now locked in a contract stand-off, was for sure furious with his teammates and the result – so much so, that he didn’t even speak to anyone afterwards. Sanchez, whose contract ends in 2018, has been offered a new improved deal worth £180,000-a-week to stay put, but has also had an interest from China worth more than double that amount. But a figure around £250,000-per-week is more to his liking, with the 28-year-old keen to hit the quarter-of-a-million mark if he is to sign a new deal. Sanchez has stalled on any contract talks and made it clear he wants success as well as improved terms, which leaves some of his teammates believing he does already have an offer from another club lined up. Fernando Felicevich, the man in charge of Sanchez’s negotiations with Arsenal, is reported to have been working with Ozil’s representatives to sort out the pair’s contract talks with the north Londoners. He has, perhaps, introduced the bargaining chip of that £400,000-per-week offer from China for Sanchez’s services and would have no shortage of suitors for his client if they decide to move on from Arsenal. So what are the next major steps in Sanchez’s situation? Arsenal will have to face these ahead of the summer transfer window, not now. The summer is also quite significant considering Sanchez’s thinking. As this season goes on, he will either witness Arsenal provide evidence that they have the firepower to challenge among the elite at home and in Europe – or they will fall short once again. The Gunners’ performance in the big competitions will go some way to defining the Chilean’s decisions – coupled with any transfer plans Wenger pulls together. Arsenal have won only one FA Cup since Sanchez arrived in 2014, and have never really looked close to Premier League or Champions League glory. Juventus was Arsenal’s strongest competitor for Sanchez’s signature when they outplayed the Italian giants to his services following the 2014 World Cup, and the Serie A giants are certain to be in the mix once again. Alexis earned his reputation in Serie A with Udinese before he joined Barcelona, and could relish the prospect of linking up with fellow South Americans Gonzalo Higuain and Paulo Dybala in what would represent a frightening front three. It would also give him a chance to taste the happiness of silverwares.